There are just 17 species of penguin worldwide, 4 of these live and nest on and around the Antarctic continent and a further 3 live and nest on Antarctic and sub-Antarctic islands, giving 7 species that can be considered "Antarctic Penguins". 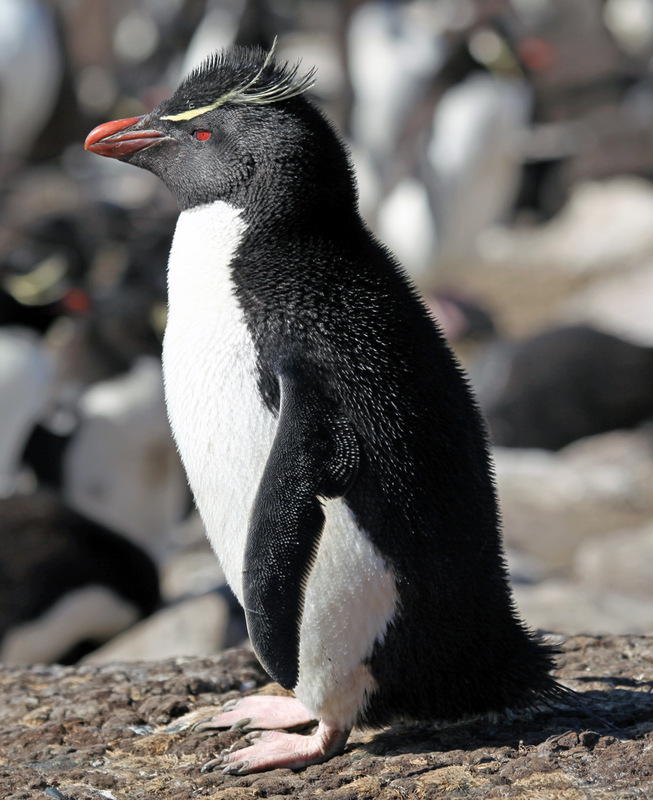 All 17 penguin species live exclusively in the Southern Hemisphere apart from the Galapagos penguin which just about qualifies as living in the Northern Hemisphere as it spans a narrow band at the equator in the Galapagos Islands. Antarctic continent and sub-Antarctic islands. 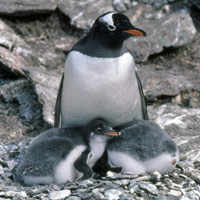 Sub Antarctic and Antarctic islands, Antarctic Peninsula. 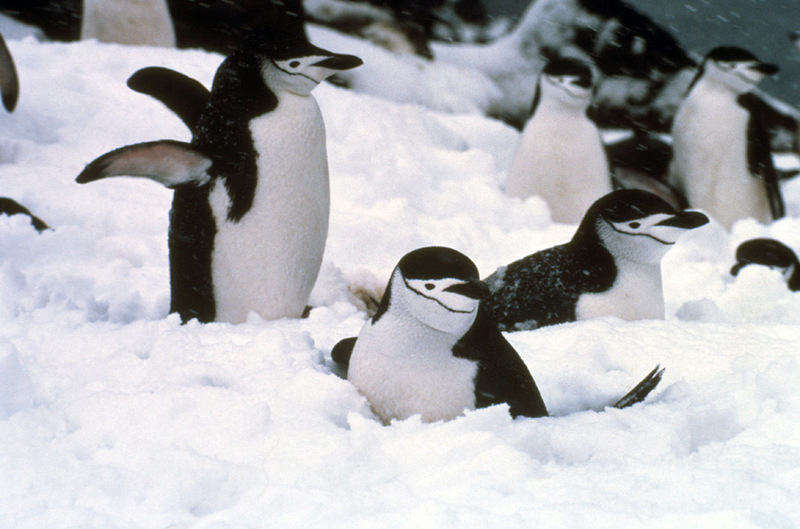 Continental Antarctica on the sea-ice, the most southerly of all species of penguins. 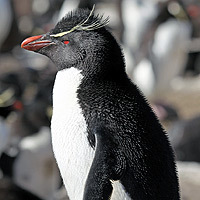 Falkland islands and south to the sub-Antarctic islands, the most northerly of the 4 Antarctic species. Starts in November or January, complex breeding system, early or late breeders - raise 2 chicks every 3 years. 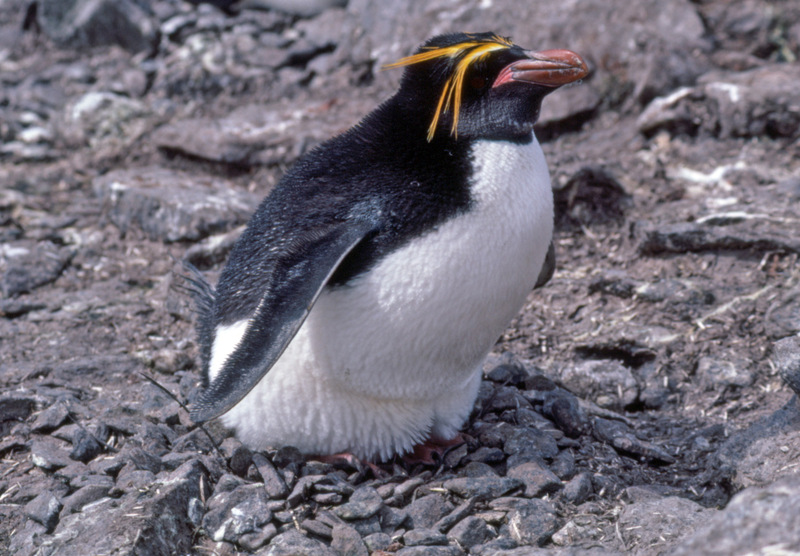 sub-Antarctic islands 46° to 55° South. Biggest colony is on South Georgia. Many populations are in decline. Falkland islands and sub-Antarctic islands north of the Antarctic convergence. Many populations are in decline by 40% and up to 94% for certain colonies. 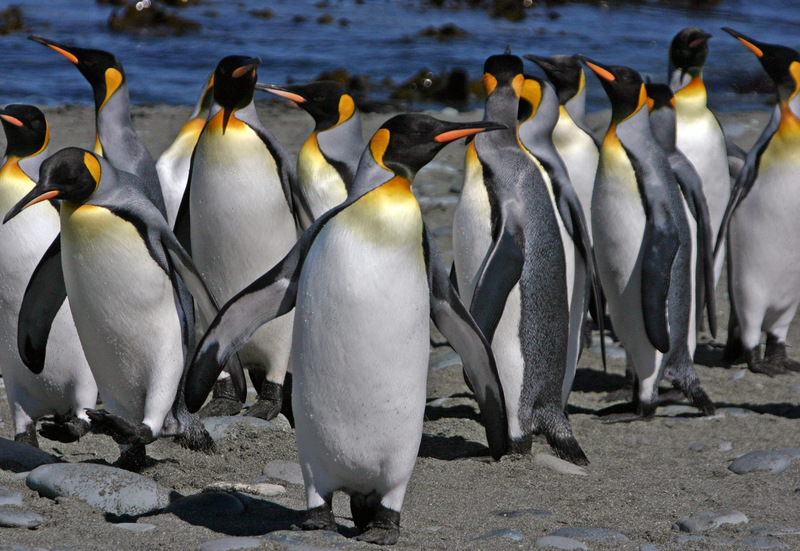 Waddling and energy savings - If you've ever seen a penguin walking, you'll have seen it moves along with rather a comical motion swaying from side to side with each step like an upside down pendulum. This is a consequence of being a tall top-heavy animal with short legs. Recently studies have found that this is actually a very efficient way of walking with the swaying motion leading to an 80% energy saving compared to a more static walk. They can move quicker and more efficiently out of the water by "tobogganing" on slippery icy or snowy surfaces, they lie down on their front and push themselves with their feet, using strong toes and claws to get a grip, in this way they can outpace a running human. Unlikely as they look, penguins ways of moving themselves on land are effective enough to cover 100km or more at times if cold weather freezes the sea between the open water and their nest site. Penguins can come out of the sea onto rocky shores or slippery ice during rough weather - strong claws that can grip on to slippery surfaces efficiently make this look far easier than it is. 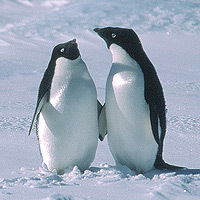 Smaller penguins "bounce" - Small size means less kinetic energy if the penguins are thrown around and so less damage. 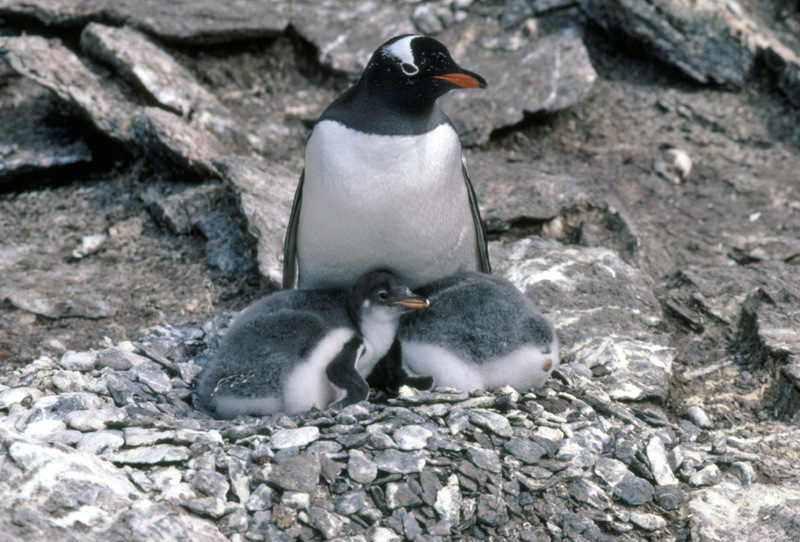 The smaller penguin species can come out of crashing waves and rough seas on inhospitable, difficult rocky shores without being smashed to pieces precisely because they are small and so don't have so much kinetic energy if bashed against a rock, an inherent toughness and blubber padding helps too. Feet pulled in when swimming - like an aircraft pulling in its landing gear to reduce air resistance, penguins pull their feet close to their bodies when swimming for maximum streamlining and drag reduction. 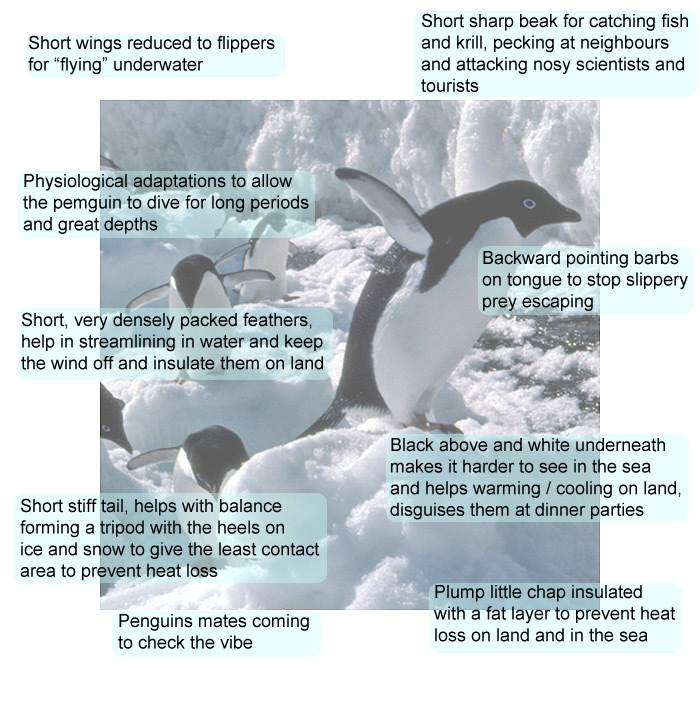 However when needed they can be used like a water-brake, stuck out at the right moment, a penguin can use its feet to make a 180° turn in 1/5th of a second. Elbow and wrist joints are fused - this gives a more rigid forelimb that is developed into a paddle (flipper) for swimming underwater. Collect air in their feathers by preening - like many other birds, penguins spend a lot of their time preening their feathers, much of this is to fluff the feathers out and so collect air amongst them, this is done particularly before going to sea. There are two benefits, firstly it aids insulation and secondly when the penguin swims particularly quickly this air is released as micro-bubbles which lubricates the penguins path through the water, so reducing drag. 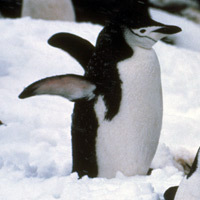 It has been shown that penguins can leave the water in a burst of speed in this manner that is twice their theoretical swimming speed without it. Particularly useful if being pursued by a predator or if a jump to extra height is needed to get onto the ice and out of the water. 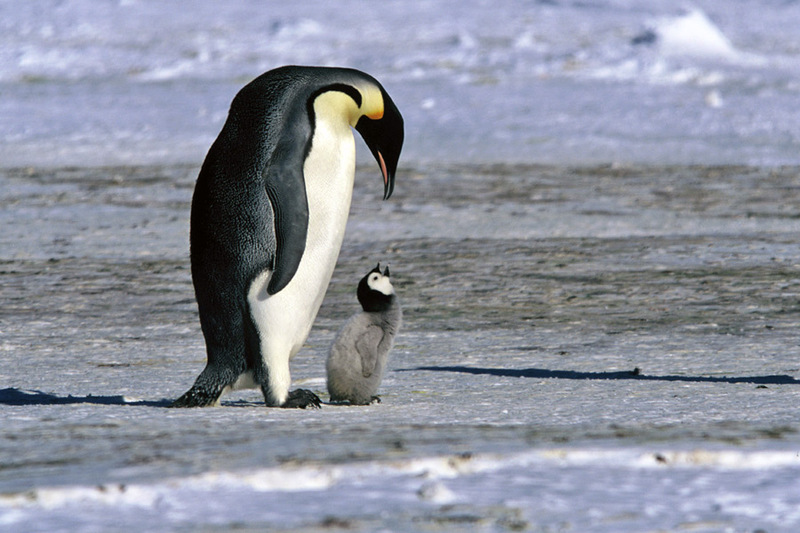 Nest building - All but king and emperor penguins build a nest, though they are usually only a simple pile of stones that are continually stolen and swapped between the members of a colony when the owners aren't looking. The nests are slightly higher than the surrounding land so that if the temperature rises and the snow melts, the nest is not flooded. 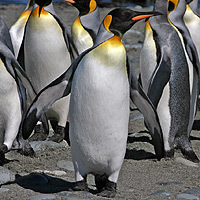 Emperor and King penguins keep the egg and then the young chick on their feet covered by a brood pouch until they are large enough to regulate their own temperature. 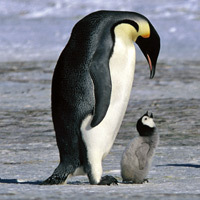 Breeding Colonies - Penguin colonies are very loud, raucous, busy and smelly affairs. The call of all penguins is as musical and gentle as a braying jackass and the whole colony is usually awash with penguin guano (posh word for bird poop). When I was in Antarctica one thing I did was help with long-term surveys which entailed walking through the colony (terribly frowned upon these days). 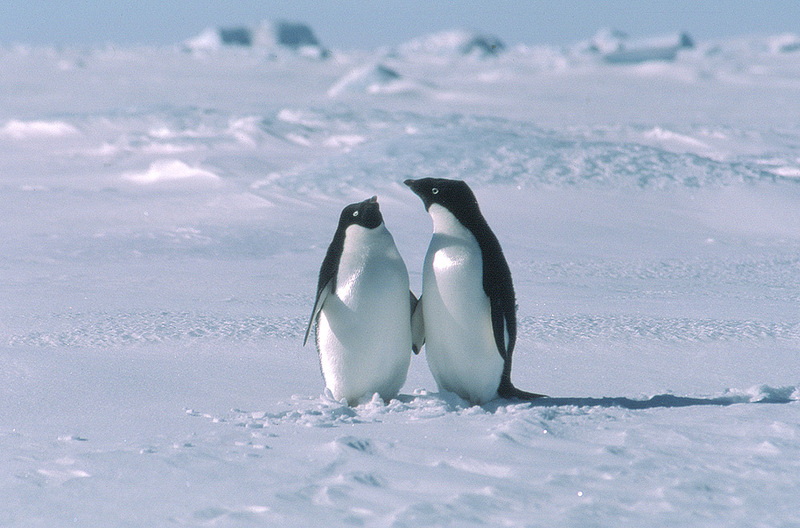 Each nest is just over two pecking distances apart so the penguins can't reach each other. Of course walking through the middle meant that you were in range of everyone. 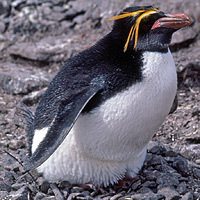 I used to worry a lot about slipping over in a penguin colony, covered from head to toe in guano and pecked mercilessly. Reproduction - Colonies may be of just a handful of breeding pairs or up to half a million birds and more. Many species lay two eggs, though it is rare that two chicks are raised, if food is short it will be fed to the biggest and strongest only. Male and female parents share egg and chick duty. Chicks are fed regurgitated fish and krill (yum!). The chicks leave the nest (or parents feet) when they are large enough to keep their own temperature constant, they form crÃƒÆ’Ã‚Â¨ches to give each other mutual support and protection from marauding skuas and also to protect against the cold and wind. Predators - Penguins main predators are leopard seals (the main predators of adult birds) and Skuas (the main predators of eggs and unguarded chicks).